This circuit is a very simple circuit-level indication, with 10 Led. LM3915 IC is used to control the led, as an indicator VU Meter. This circuit uses just one IC and a very few number of external components. It displays the audio level in terms of 10 LEDs. 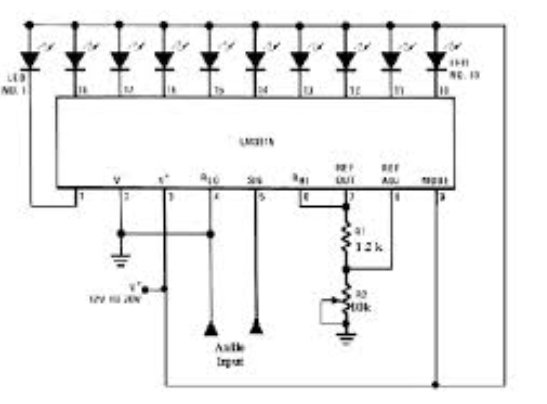 The input voltage can vary from 12V to 20V, but suggested voltage is 12V. The LM3915 is a monolithic integrated circuit that senses analog voltage levels and drives ten LEDs. The whole display system can operate from a single supply as low as 3V or as high as 25V.